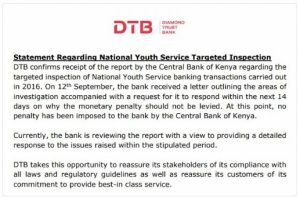 The Central Bank of Kenya (CBK) has levied bank fines against five institutions over transactions relating to their handling of payments and movement of funds sent from the scandal-plagued National Youth Service (NYS). The banks are Diamond Trust which handled Kshs 162 million, and was fined Kshs 56 million, Co-operative Bank which handled 263 million (and was fined 20 million), KCB which handled Kshs 639 million (fined 149.5 million), Equity moves Kshs 886 million (89.5 million fine) and Standard Chartered which handled Kshs 1.63 billion from the NYS, and which was fined Kshs 77.5 million. The CBK statement read that the bank fines followed investigations into failures at the banks including; not reporting large cash transactions, not doing due diligence on customers, lack of support documents for large transactions and lapses in reporting suspicious financial transactions to the Financial Reporting Centre (FRC). 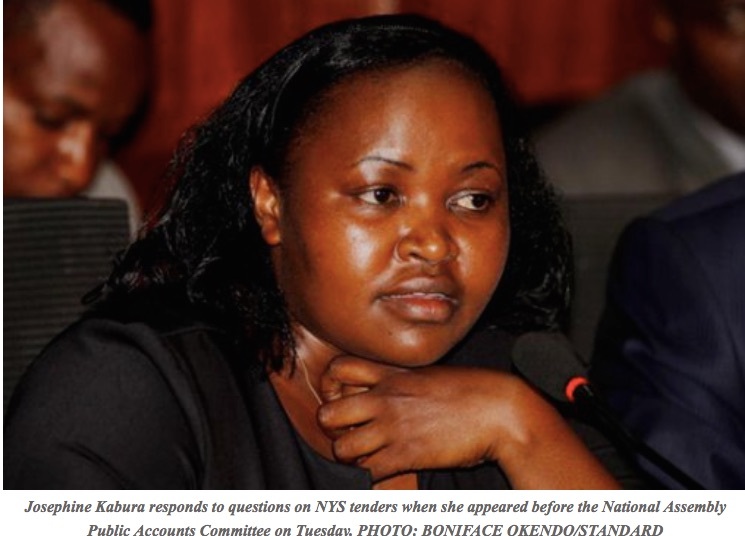 Notably missing was Family Bank that featured heavily in a prominent series of transactions of funds that originated from procurements at the NYS. It has been previously sanctioned and branch and senior staff are being prosecuted. All the banks which handled NYS funds had been named earlier and the CBK statement added that this was not the end, with an additional group of banks set to be identified and investigated. This entry was posted in AML, CBK, Co-op, Diamond Trust, Equity Bank, KCB, Youth Funding and tagged antimoneylaundering on September 13, 2018 by bankelele. The Central Bank of Kenya (CBK) has published new guidelines to assist Kenyan banks to assess and mitigate the risk that their institutions and systems may be used for money laundering (ML) or terrorism financing (TF). Senior management of banks are to implement board-approved money laundering/terror financing policies. Bank staff are to prepare periodic reports on money laundering and terrorism finance for their senior management and boards of the bank and also communicate these to the CBK. Financial institutions will be required to appoint a money laundering reporting officer who will be the point of contact for CBK. Banks should assess and rank TF and ML instances and actions in terms of high, moderate, and low risk. They should identify countries and regions that are high risk for business; high-risk includes countries subject to sanctions from the UN and other credible organizations, countries that don’t have appropriate banking safeguards and countries known to sponsor terrorism. Banks are to assess their customers for money laundering and terror financing risks; suspicious customer activities include frequent and unexplained movements of money to other accounts, or other institutions, and to far locations. They should also look at politically exposed persons who bank with them including prominent public figures, senior politicians, judicial officers, corporate CEO’s who dealing with them, or their families, may bring a reputational risk to the bank. Banks are to assess their service delivery channels for money laundering risks. They are to pay attention to cash-intensive businesses, including supermarkets, convenience stores, restaurants, retail stores, liquor stores, wholesale distributors, car dealers. The guidelines follow an earlier directive on paper bag banking from two years ago. The new ML and TF rules are in draft form and bankers and any interested persons are invited to send comments to the CBK on the proposals before January 31, 2018. This entry was posted in AML, CBK, Corporate governance, corruption, economic sanctions, Terrorism and tagged antimoneylaundering on January 3, 2018 by bankelele. Last week Josephine Kabura got to testify about her banking transactions before a televised Parliamentary Accounts Committee (PAC) hearing of an ongoing investigation of the National Youth Service (NYS), and she made some rather startling claims about having tens of millions of shillings from the NYS deposited into her company accounts which she instantly withdrew in cash to pay her suppliers. But in the absence of closed-circuit television (CCTV) footage, which banks typically don’t keep for too long (the security companies erase them over if there are no security incidents), the documentation and bank rules covering cash handling risks, fraud, and money-laundering simply don’t support these claims. While MP’s asked her about the physical improbability and difficulty of her carrying that money out of the bank (sums of Kshs 40 million in paper bags) to go pay suppliers at a quarry, the possibility of this is unlikely. A vault at an obscure bank branch is unlikely to have more than Kshs 10 million shillings sitting around. Banks allocate money to branches based on their usage (average daily deposits and withdrawals) and it is unlikely that such amounts of money in paper currency would ever sit idly around as there are insurance and cash handling costs and risks. Within the bank, risks managers and systems would have noticed patterns in her company accounts, previously empty, and now suddenly receiving millions of shillings per day, that she immediately withdrew in cash. Also when someone tries to send, transfer, or withdraw over $10,000 i.e. ~Kshs 1 million, it triggers an extra form at the bank that must be filled out and later sent to the Central Bank explaining the purpose of the transaction. Usually, the head office of a bank will ask for extra documentation, such as invoices or contracts to support the processing of such a transaction. A similar case with suspicious payments received from the Youth Enterprise Development Fund at Chase Bank showed how such account activity triggered alarm bells within a bank and subsequently with the regulators. When Kshs 100 million is wired to your bank, it does not mean that Kshs 100 million magically appears at your bank branch to be withdrawn as cash. At any branch, the tellers and cash managers have limits of cash they can handle or approve at any given time. They have to get approval, or witnesses to do larger transactions and those are in exceptional requests. Bank systems are set up not to allow suspicious transactions that exceed pre-set limits and daily thresholds. For more money to be allocated to a bank branch, a top decision would have to be made by bank directors to allocate and transport more money to serve the enhanced needs of customers at a particular branch. But it is more probable that such a customer would be “upgraded” and transferred to another branch for premium customers with better security and with higher cash limits. Such a customer would also be assigned a relationship manager to help them manage their liquidity (in this case – Kshs 1.6 billion in 14 months) even better and cross-sell them other bank products. It is more probably, as MP Abdikadir Aden, postulated at the PAC hearing, that the cash was never really there. When large sums were wired in, withdrawal transactions were initiated to show that cash was being withdrawn, but that the reality was that, simultaneously, other transfers were done and cash deposit slips were filled in to reflect cash deposits for the exact same amounts, into other accounts, a few minutes later. Finally, earlier this year, the Central Bank issued new rules that further restricted deposit or withdrawal of cash. Could this have been due to the same Kabura activities that happened over a year before? This entry was posted in AML, bank service, CBK, corruption, Family Finance and tagged antimoneylaundering, moneylaundering on November 7, 2016 by bankelele. The Central Bank of Kenya (CBK) has sent out new mandatory guidelines to banks to be on the look out for large volumes of cash being transacted over the counter. The notice targets customers who withdraw or deposit cash amounts of Kshs 1 million (~$10,000) or above. Why can’t the cash deposit or withdrawal be made through electronic means? What is the money going to be used for? Who will be the direct and indirect beneficiaries of the money and provide the identity of the intended beneficiaries of the money. The guidelines are drawn from existing crime and anti-money laundering regulations, and come after other attempts in the past to target money laundering, corruption, terrorism, or crime funds being transferred through mobile phones or remittances / hawala. But it seems, there’s been a realization, probably after investigations into the NYS saga, that cash was moved between banks in paper bags. In Kenya, large sums (over Kshs 1 million) are meant to be transferred through electronic funds transfers (EFT) and real-time gross settlement (RTGS). Indeed cheques over Kshs 1 million are not accepted unless they are in support of amounts being transferred between accounts within the same bank. This entry was posted in AML, bank service, CBK, M-Pesa, Remittance and tagged antimoneylaundering, moneylaundering on January 23, 2016 by bankelele.